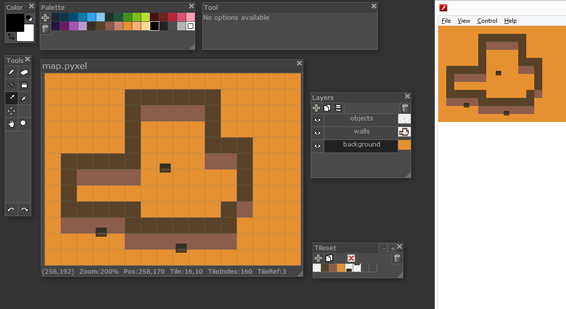 If you’re using the awesome pixel editor Pyxel Edit (free version) and you happen to be a haxe user, you can probably use my importer. This is a really simple project but this is still time you can save for something else. You can basically retrieve a tile array of each layer and this is framework agnostic; but if you’re using openFL, i made a helper. Assuming you know almost nothing about networking. You can actually make a MMO – honestly in a jam environment, mmo doesn’t mean much, so yeah you can make a game with mechanics revolving around unlimited number of players – if your server can’t handle it, you probably already won Ludum Dare anyway. Dont make an online game – unless you’ve got a good reason to, you’re going to lose a lot of time no matter what. Know your tools – If you can play with the network stuff beforehand, it’s better. Unity networking is great for jamming – RPC & Component synchronization are fun things to play with; maybe less approachable than a simple simple send(x, y) though but this depends on the library and how you like to approach code. Consider using a game networking service – This is actually highly recommended, it wasn’t in this list at first because there wasn’t point 4. but things like SmartFoxServer, PhotonCloud, Player.io, Firebase are really great, they basically offer you an API client-side and handle all the server stuff themselves. It makes a lot of points disappear (like 5. ); try the Firebase online tutorial, it’s damn simple. If you’re in a strange setting or if you don’t want to go this path try to estimate the time of handling the server hosting, port forwarding, firewall surprises and policy servers in some cases. Don’t make a dedicated server – aka don’t put all the logic on the server. Unless you’re comfortable with it, just make a simple server relaying messages between clients. If you’re using point 7. it’s already done for you. Client-side logic is alright – this is a jam. Cheaters are fine – The logic is on the player side, anyone can break things, but you don’t care. Don’t mind serialization – strings/JSON are probably fine too (don’t think in bits, obviously). Use reliable messages – If you’re using TCP you’re set, and for UDP libs, any decent one should have this option. You probably don’t want the hassle of handling unordered and missing packets for a jam. If you’re using point 7. it’s probably abstracted. Think networking / organize your code – this is probably the most important. Every line of code you write you should think about what message you will send and how you will consume it at the other end, so present your datas correctly. This is probably less significant when you’re not in a dedicated server setting but this is a good rule to separate your logic from your rendering anyway. Starting your project with network code is not a good idea YMMV – i used to make networking work before any game-related code but this is actually a real drag when tweaking & playtesting. It seems a bit idiotic to playtest a multiplayer game without players so you probably don’t want to do that (◑◡◑) but do as much as possible in local : art, game feel, rules (keep in mind point 13.) and then switch to the netcode. Having to start a server + client instance to tweak something while noticing this little network bug that prevents you from fixing this other thing is really annoying. Finish your game in the first 24H – Spend the first day making your game, spend the other one with network code, tweaking & playtesting. Try to give the right amount of YOLO-coding, be a bad coder when you can be bad (there’s a lot of room for this), be a tad less bad when it matters : game crashes. Don’t underestimate the productivity gained by time pressure aka the last hours : you probably don’t want to handle unexplored areas (networking) under too much time constraints, keep the constraints for what you know best so code it early, but not too much. The Jam (72H) is probably more realistic. Turn-based games are good for a jam. Real-time games are fun, but probably not a super idea for a first multiplayer game. Don’t dive into all the Gafferon Games / Valve / Quakeworld / Quake3 articles that you bookmarked a while ago. Send your player position to the server is simpler than inputs – remember jam. You might need a physical server of some sort – use your computer, a raspberry or the free amazon vps tier (Credit Card needed) or use point 7. and you’re set. Don’t be overwhelmed by the amount of points – PhotonCloud/FireBase/Player.IO/SmartFoxServer make things really simple, forget this list and play with their API. “The secret to writing a networked game for Ludum Dare is to avoid writing networking code” as a redditor said and those services try to do just that. Those lists often make the author sound pretentious – what legitimacy does he have ? All those do this and do that :3 There’s not only one way to do stuff, what if i want to tunnel a UDP packet into a TCP packet into a UDP packet ? All those rules are probably not applied by the author himself – i feel like most of those rules are mostly reaction rules to what people doesn’t succeed at. It’s a kind of never reached nirvana for the author, something that you frame in your room and stare at while working out, naked. Good job, you’re now a horrible network programmer.. but what makes you different from 99% of the world is that you actually finished a multiplayer online game while people are still struggling to pack as much datas as they can into one byte. And the good news is that nothing prevents you to improve your network code with proper design. I feel bad for some of those points so i want to correct a few things. A dedicated server is generally a better way to separate your network code from your rendering code, it’s also a good training for organizing your code. Use a fixed timestep loop, it makes synchronization way better and lag compensation easier. Actually read the Gafferon Games / Valve / Quakeworld / Quake3 articles; this is still a drag to actual productivity if you’re falling into all these optimizations. Keep it simple but not necessarily at JAM-quality. Note that you might question my legitimacy and i have no answer, most of my LD games are mostly crap, the last one is bad or probably average at best but this is not a game-design post, this is a “netcode takes time, here some tips to give you more time for game-designing while being a worse network programmer than you were before even starting” post. You can click the GIF to have a look at my average (jam) entry. I’m also using this post to make a list of multiplayer online LD games, if you happen to have made one, tell me in the comments or @caribouloche. Seems like i finally fixed the server but i need to see how it behaves with real players. I might be able to make a build in one hour or two. The game is working in multiplayer but i have an annoying issue where a player disconnection make the server crash. I suspect a socket block error killing the app but being silenced by my try/catch that i’m using for buffering datas, not sure about that but i’ve been spending way too much time on a non-game-related bug and while i’m often glad to make the stretch until 3AM i don’t feel like i’ll be able to wrap this up on time. I hope to finish it at some point though. The animation is kinda meh but i will come back to it if i’ll find the time; i will continue working on the feeling part a bit and i then i’ll start adding the server. Failing Making multiplayer online games most of my LD’s i’m really curious to know who’s with me in the genre, there were a few but really fun ones a few LDs ago, i remember a fighting platformer and some really frenetic and good-looking mining game (WITH LASERS). I’m in again hoping it will be better than my last one, aiming for some simple and decent mechanic to come out of my brain, more in the spirit of The last Square. Who will dare making a MMO ? I didn’t like True Blood much but what i hated the most was that stupid Sookie character. The whole code workflow : the past ludumdares contained some nice surprises, bugs, physics related issues… But from start to finish i didn’t encounter many problems on that project (if you don’t count network settings). The server didn’t fall down \o/ (much). I am not used to work with flash stuff and for whatever the reason i decided to host the web server myself instead of just shipping a *.swf file on a dropbox. Too much fight with my firewall. A few server downtimes since the ip was actually hard-coded and my ISP is updating it every day i had to make a few changes but it was actually quickly fixed by changing / adding servers. The font ! There’s a chat in the game so i had to find a cool font, i did find it but there were no punctuations, no numbers : just letters. It was a bit frustrating. I wish i would have allowed me a bit more time for the instructions, most players are complaining about that. Even with a screen at the start of the game, it didn’t work well, grey on grey and just a few lines of text are not good enough. After not understanding the rules you are not helped much within the game as well, there’s not enough visual feedback about where you can build a tower or when you can build them. The list of the players on the right were actually a ranked list, but i’m not sure many players understood that since there was no indication whatsoever. I should show the percentage of the map conquered and the % of the map you have to conquer to win the game. Basically more feedback for everything. I’ve already made a *lagfree* version of the game but since it didn’t take much time to code, it would have been better added in the submitted version. I’m going to put the project on github, i’m not sure i will work on it right away since i have other projects but after adding more feedback features as explained earlier, one cool thing would be to make it totally cross-platform between C++, Flash & HTML builds. I’ve actually used the flash networking library for that project but i’d like to use haxe networking and see how it goes. I started late, trying not to aim too high, but still wanting to add some fancy stuff like XP, ending up at -5 minutes without any thought on level designing. I made a batman costume ! I think i would have finished it with one more day but that would still be an unfunny game based on XP instead of cool mechanics. I’ll try to shape it into something playable in the future. We all read articles about not being trapped by adding too much things, about cutting features, thinking small… But I still fall in those traps and that’s why Ludum Dare is fun and rewarding. Let me share my admiration for “Step Off” by intmain, which has basically the same *concept* but is waaaay more fun, cool feeling and awesome graphics. You can try mine here. 32 queries executed in 0.120 seconds.